The Detail Guys of Reno, NV immediately after the Sept. 11th attacks scheduled a fundraiser to raise money for the fallen NYC Firefighters. 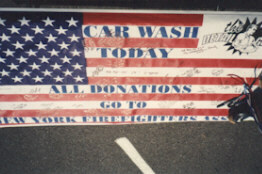 Each car wash fundraiser customer was asked to sign a giant flag with a message to the families and friends of those heros who gave their lives so that other could live. 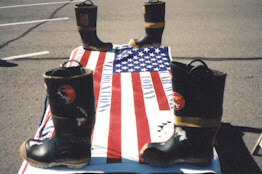 All customers deposited their money into a pair of boots donated from the Reno Fire Department for the fundraiser. Detail Guys were assisted in the event by the local Junior ROTC, LDS Church, and the Boy Scouts. Special shirts were made for the fundraiser. The message was clear, "We WILL NOT live in fear. We are Americans! 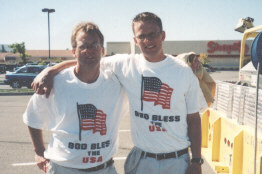 and God Bless America".